A new theatre company has set up shop in Detroit and is now open with its first production. Courtney Burkett and Sarah Winkler are co-founders of the Detroit Public Theatre which brings live theatre to the Midtown district. Burkett is a lifelong Detroiter; Winkler has relocated from New York. With their collective years of experience, they make a formidable creative team. Their vision is to present plays that reflect the city’s edginess, shows that mirror the gritty character of Detroit’s blue-collar reputation. The theatre’s opening comes at a time when Detroit is experiencing an economic and cultural resurgence. Performances of the DPT are being held in the Allesee Rehearsal Hall inside the Max M. and Marjorie S. Fisher Music Center. The hall has been outfitted with some 150 seats and the staging area is capable of handling a variety of configurations. Four shows are scheduled for the 2015/16 season, in November, January, March, and May. 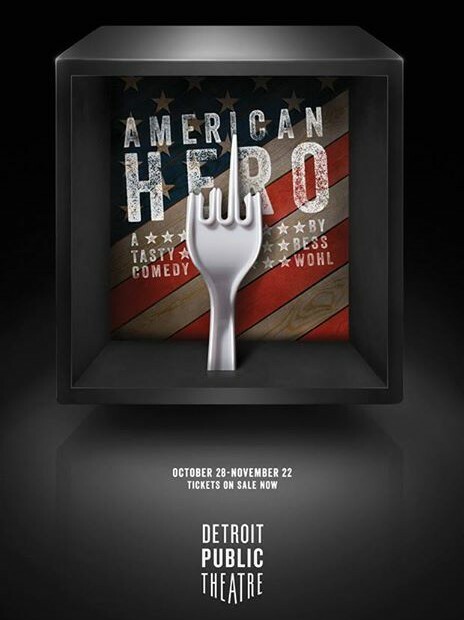 The show that Detroit Public Theatre has chosen for their inaugural offering is the dark comedy “American Hero”. It’s about three new hires at a sub shop who discover that the owner has become totally uninvolved with the running of his business, which includes not reordering food as it runs out. But the three sandwich makers need their jobs, so they continue to serve their customers even with dwindling food supplies. Bob, the owner of the Hero franchise, speaks with an accent, but where he might be from is never made clear. An overheard backroom conversation with him on the phone speaking in a foreign language hints at possible connections to terrorism. The only thing the owner seems to know about the restaurant business is what he can read in the franchise’s booklet of rules. One of those rules requires that the making of a sandwich has to be completed in 20 seconds or less. The production line of employees cutting bread, stuffing it with cheese, lunch meat, and lettuce, then squirting it with dressing and wrapping it in the allotted time is one of the funniest routines in the play. It’s reminiscent of that classic episode of the “I Love Lucy” show where Lucy finds herself overwhelmed by the conveyor belt at the chocolate factory. Bob is played by Lynch R. Travis, who garners additional casting credits playing a customer, an executive from Hero’s national office, and a sandwich, that last role one which will undoubtedly be left off the next updating of Travis’ résumé. The bulk of the show belongs to the three employees. Ted (Milan Malisic) is a regular sort of guy, a happily married Irish Catholic with a wife and two kids to support. He’s lost his mid-level position at a bank and taken the restaurant job because it’s the only thing he could find. Jamie (Maggie Meyer) is street smart, belligerent with authority, and a flirt. She’s also recently unemployed and anxious about an upcoming court case that will determine whether or not she will be allowed to keep her children. Sheri (Lisa Michaels) is a young woman long on ability and short on self esteem. At the end of her Hero shift, she heads off to her other job at a Mexican restaurant and sleeps in her car between shifts. The question the play continually addresses is whether the three can keep the shop open while they attempt to solve their personal problems. With their production of “American Hero”, Detroit Public Theatre is off to a fine start. Director Courtney Burkett has assembled an exceptional cast of actors that mess nicely. 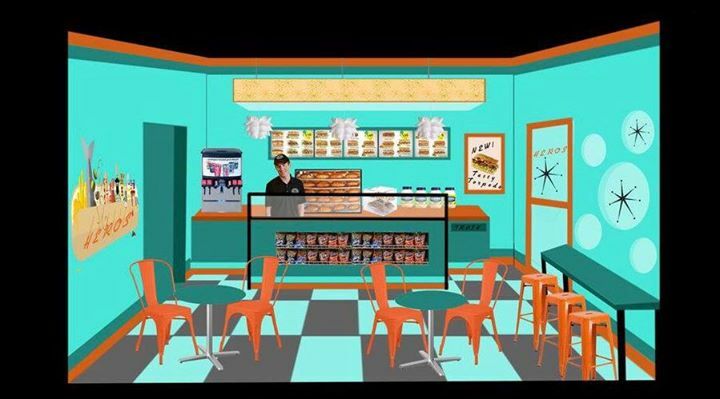 Set designer Monika Essen has crafted the colorful, functional interior of a sub shop (we really don’t call them heroes around these parts) complete with seating accommodations and a soft drink dispenser. Essen is also responsible for props and costumes consisting of American Hero T’s and the aforementioned sandwich. Lighting design is by Neil Koivu. As for the nuts and bolts of the script itself, playwright Bess Wohl straddles the fence between plot and character delineation. The play reads like a series of vignettes, sometimes focusing on the operation of the restaurant, other times on the personal affairs of the employees. As such, it never truly decides if it wants to be cute or relevant. A less dark but more cohesive version could have made good use of a fifth character playing a series of customers who have amusing encounters with the employees. And the use of the f-word and the s-word may be both edgy and a stab at realism, but they only create cheap laughs, and any claim for realism with this play went out the window with the talking sandwich. “American Hero’ runs through November 22nd. Tickets are available by calling 313.576.5111 or visiting the theatre’s website at www.DetroitPublicTheatre.org. The Max M. and Marjorie S. Fisher Music Center is located at 3711 Woodward Ave., Detroit 48201.